Thank you for visiting the WTBBL website and please enjoy the following abbreviated history of our amazing library. 1906 Seattle Public Library (SPL) began library service to individuals in Washington State who read braille. 1907 First embossed books for the blind were circulated by SPL. 1931 Washington library became part of the national braille and talking books network started by the Library of Congress (Pratt Smoot Act). 1932 Drusilla Dorland (Acting) head librarian 1932-1937. 1934 Inception of Library of Congress program; SPL became one of the regional Libraries (serving Washington, Montana and Alaska). 1937 Stephanie Howley, head librarian from 1937-1952. 1945 Library for the Blind moved to SPL Fremont Branch basement. 1952 Mrs. Howley retired and Florence Grannis took over as head librarian from 1952-1960. 1954 The Division for the Blind moved to the basement of SPL Susan Henry Memorial Library, with the lower floor especially designed for work with the blind. 1962 Records redesigned to play at 16 2/3 r.p.m. down from 33 1/3. This halved the size of books. Later developments reduced the speed further to 8 1/3 r.p.m. on flexible disks. 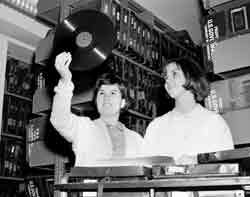 The talking books on records and flexible disks endured through the rest of the century and were finally pulled from service in 2001. 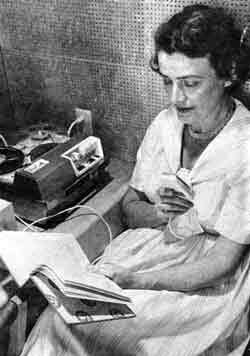 1969 National Library Service started the cassette talking book program. 1973 The name in Seattle changed to the Washington Regional Library for the Blind and Physically Handicapped. 1975 Funding for the Washington Regional Library for the Blind and Physically Handicapped shifted to the state, and Seattle Public Library's work becomes a contractual service to the Washington State Library. 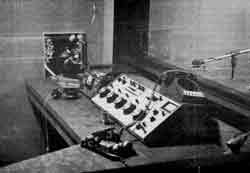 1977 The radio became the Radio Reading Service. 1979 Jan Ames became interim regional librarian on 9/5/78 and on 1/2/79 became WTBBL Director until retiring on 9/29/02. 1983 The Radio Reading Service became the Evergreen Radio Reading Service on 4/25/83. 1983 The National Guard, Boeing, WTBBL staff and volunteers moved the Library from 811 Harrison to 821 Lenora Street on 10/1/83. 1985 The Washington Library for the Blind and Physically Handicapped circulation was automated. Using adaptive equipment, blind staff members were able to access the system. 1985 The Braille Program was revitalized. 1986 A formal Children's Program began. 1994 On 1/1/94 the Washington Library for the Blind and Physically Handicapped changed its name to the Washington Talking Book & Braille Library. 1996 A State grant was secured to renovate the Lenora Street building. WTBBL was moved into temporary facilities at 717 Virginia Street (the Love Building) on 7/20/96. 1997 On 7/12/97 WTBBL moved back to Lenora Street. The entrance and address changed to 2021 9th Avenue. WTBBL continued to have the first floor, but also acquired a new dock area on the second floor, as well as inside parking. WTBBL re-opened to the public 8/4/97. 2002 Gloria Leonard, acting director 12/2/02-12/2/03, became Director 12/3/03 until moving to SPL 4/08. 2008 Danielle Miller was hired by Washington State Library/Office of Secretary of State 4/28/08 as the Program Manager at WTBBL, prior to the transition of WTBBL to the State. 2008 On July 1, 2008, administration of the Washington Talking Book & Braille Library moved from Seattle Public Library to Washington State Library/Office of Secretary of State. 2009 The first digital talking book players are issued to WTBBL patrons. 2009 WTBBL makes its locally produced talking books available for download at wtbbl.org. It is the first library in the NLS network to offer such a service. 2009 The NLS Braille and Audio Reading Download (BARD) website formally launched after a pilot phase of over two years. 2010 On June, 18, 2010, Danielle Miller, WTBBL Program Manager, Jan Walsh, Washington State Library and Sue Ammeter, WTBBL Patron Advisory Council Chair, received the National Library Service for the Blind and Physically Handicapped's (NLS) Network Library of the Year award for 2009. This award commends a regional library for excellence, innovation, and special achievement in providing library service to blind and physically handicapped individuals in a calendar year. 2012 Mayor Mike McGinn proclaimed June 5, 2012 as Washington Talking Book & Braille Library Day. WTBBL was honored with the Mayor’s Award and Proclamation for its work empowering individuals with disabilities. A Mayoral Proclamation was presented to Danielle Miller, Program Manager and Quincy Daniels, WTBBL patron, in print and braille. 2012 Braille books, including titles transcribed by WTBBL volunteers, become available on BARD. 2013 The BARD Mobile app for iOS devices is released. An Android version debuts in June 2015. 2014 WTBBL ships its one millionth talking book on digital cartridge: Dancing to the Concertina’s Tune by Jan Walker. 2014 The last cassette books were sent to patrons, concluding 45 years of circulation. 2014 WTBBL posts its first locally produced digital talking book to BARD, The Alpine Journey by Mary Daheim. Readers nationwide begin to have instant access to books produced in WTBBL studios. 2017 WTBBL is named NLS Network Library of the Year for the second time. WTBBL Director Danielle Miller and Washington State Librarian Cindy Aden accept the award from NLS Director Karen Keninger in a Library of Congress ceremony.